To visit the Roanoke River Replica Lighthouse, take Hwy. 64 to the town of Plymouth. Turn on to Washington Street. Then make a left turn on W. Water Street. The lighthouse is just down the street on the right side next to the river. 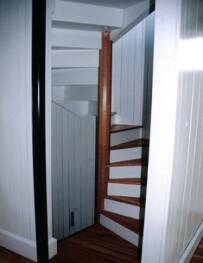 The center stairs leading to the second floor and lantern room. In the early 1800's, the United States Lighthouse Establishment began the task of constructing markers to aid navigation into strategically important rivers across the country. As ships sailed into the sounds of North Carolina from the Atlantic Ocean, they needed guidance from these markers to identify not only their location, but also an aid in safe passage into the mouth of the rivers. One such place where a navigational marker was needed was at the mouth of the Roanoke River. 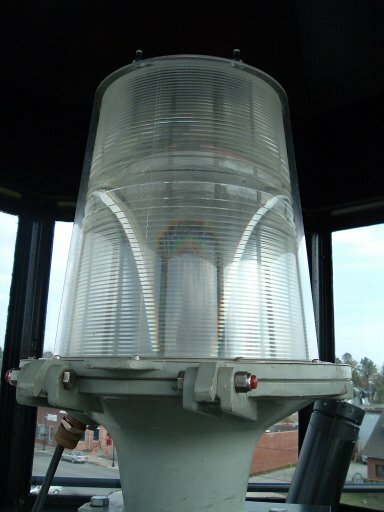 The first marker of the mouth of the river was in the form of a light vessel, and was established in 1835. This vessel was a three-masted ship, equipped with whale-oil lamps and multicolored lenses, and was anchored in place as a constant marker. This vessel continued to mark the river entrance until the outbreak of the Civil War, when it fell into the hands of the Confederacy. The ship was later seized by the Union forces and then used against Confederate forces at Plymouth. When the Civil War ended, construction began on a screw-pile structure to replace the light vessel at the entrance to the river in 1886. During the winter of 1886, the Albemarle Sound froze, and caused two of the screw-pile“legs” of the lighthouse to be damaged to the extent that the lighthouse fell in to the water. The following year (1887), the lighthouse was replaced, and was in operation until it was decommissioned in the 1950’s. As with many other river lights at that time, the Roanoke River light was sold to a private owner for use as a private residence, and was moved to Edenton, where it remains today. 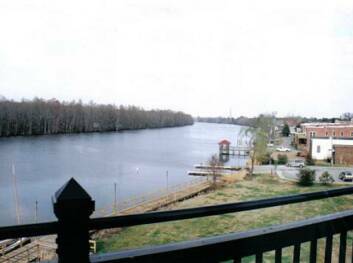 In 2001, construction began on an exact replica of the original Roanoke River lighthouse. This replica is now complete and it is located in the waterfront town of Plymouth, which was the strategic port in which the original structure help establish. The replica is complete with a working modern fourth-order lens. The replica is open to visitors on a limited basis. For more information on the lighthouse, please visit its official web site at www.roanokeriverlighthouse.org. 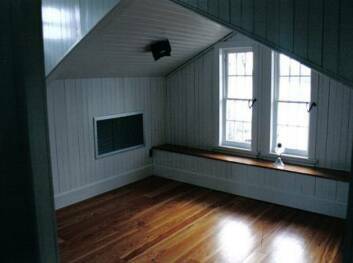 This is a shot of the main floor of the replica. 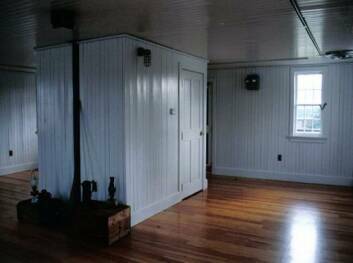 In the original lighthouse, this area was broken up into six rooms.